KUALA LUMPUR — Gulajan Binti Nur Hamad was only 9 years old when she saw her house set ablaze by rampaging Buddhist mobs. “There was fire and fighting,” she said, running her right hand across her throat in a hint that she had seen worse than the flames that left her family’s home in ashes. Gulajan was one of more than 140,000 Muslim Rohingya driven from their homes in 2012 during violence between Buddhists and Muslims in Myanmar’s western state of Rakhine. Gulajan was left homeless when ethnic Rakhine mobs in October that year attacked the Rohingya Muslims living in the area of Kyaukphyu, an oil and gas port where a major pipeline comes ashore before traversing Myanmar to China’s Yunnan Province. Weeks after the bloodshed — Gulajan said she does not remember when exactly — she and her family boarded a boat on the Rakhine coast. Nine days later, after being cramped shoulder-to-shoulder with the 400 or so people on board, with food provided only every second day, the boat landed at the Malaysian island of Langkawi, off the coast of Penang state. The Rohingya are a stateless minority numbering over 1 million and living mostly in western Myanmar. Gulajan, now 12, is among the tens of thousands of Rohingya who have made the journey to Malaysia, a Muslim majority country, in recent decades. That steady exodus long predates the “boat people” crisis that made world headlines in May after Thai and Malaysian investigators unveiled mass graves of suspected smuggled migrants and trafficker death camps on either side of their mutual frontier. Over the following weeks, several thousand Rohingya refugees and Bangladeshi migrants sought to land on the coasts of Indonesia and Malaysia, with an estimated 6,000 to 8,000 people adrift at sea at the time. Gulajan, now a student at the Rohingya Community School run by a nongovernmental organization called the Malaysian Relief Agency in Kuala Lumpur, is picking up the basics of English to go with her almost fluent Bahasa Malaysia. “Twelve. Twelve years old!” she exclaimed, as if exasperated with fellow student Ramzan Ali, who had asked her — in Malaysian — to give her age. Ramzan, 16, is a Rohingya who calls Malaysia home. His family left Myanmar long before he was born — he does not know when, exactly — but his grandmother told him that she left Myanmar three decades ago, one of around 200,000 Rohingya who fled, mostly to Bangladesh, during Myanmar military operations in Arakan state, an alternative traditional name for Rakhine. “I want to stay in Malaysia. I like Malaysia,” Ramzan said, hinting at tensions with his family, all of whom want to emigrate to a Western country. But for many Rohingya in Malaysia, life in their country of refuge marks no more than a slight improvement on the discrimination and legal limbo that characterized their existence in Myanmar — conditions that “forced Rohingya to leave for a new life in the promised land that is Malaysia,” according to Norian Mai, chairman of Perdana Global Peace Foundation, a philanthropic organization. Norian was speaking in Kuala Lumpur at a June 12 conference on the Rohingya. “We are thankful to Malaysia for letting us stay in their country,” said M.S. Anwar, a news editor with Rohingya Vision TV, a media outlet founded in 2012 in Saudi Arabia but now operating in Kuala Lumpur, Malaysia’s biggest city. Anwar, 26, left Myanmar in 2007. He said he was chased out of the Rohingya stronghold of Maungdaw, on the Myanmar-Bangladesh border, by Myanmar’s feared military intelligence. Anwar is one of the 45,000 Rohingya who have acquired United Nations refugee status in Malaysia — a sometimes elusive and usually long-awaited prize for those who make it across the sea from Myanmar. He has a job, too, unlike many Rohingya, who either cannot find work or are confined to positions such as security guard — which Gulajan’s father has recently become. “I’m strongly wishing to be resettled,” he added, referring to an international process by which refugees are allowed to move on to third countries, usually in the West, after arriving in a transit country such as Malaysia. However, the Rohingya Community School runs classes not only in English and Malaysian but also in Burmese — the latter to remind the Rohingya that one day, they may have to return to Myanmar. That day can only come, however, “once the politicians settle everything and the Rohingya get recognition,” noted Mohd Shahrulazilan Said of the Malaysian Relief Agency. 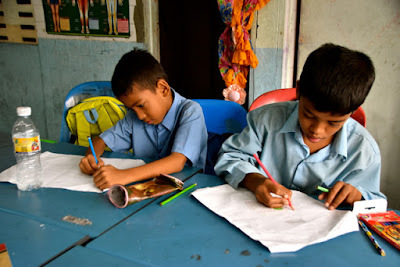 Shahrulazilan added that Rohingya parents are not all keen on the idea of their children learning Burmese, suggesting that for many, there will be no return to Myanmar regardless of whether the government changes tack and accepts the Rohingya as citizens and as a recognized ethnic group. It is more likely, however, that more Rohingya will come to Malaysia than will ever return to Myanmar. Though with the coming of the monsoon rains to Rakhine and Bangladesh, the maritime crossings are on hold for now. Myanmar has rejected accusations — including those from the Malaysian government — that its harsh treatment of the Rohingya is the cause of the exodus and maintains that the Rohingya are “Bengali” immigrants who came to Myanmar illegally from Bangladesh. But that is not how Myanmar’s Rohingya see themselves. “We are Islam[ic], so [the] government doesn’t give us jobs. We don’t have citizen[ship],” said Ferozah Binti Abdul Rashid, a 25-year-old teacher at the Rohingya Community School. She left Myanmar three years ago after being unable to find work despite graduating from the University of East Yangon with a bachelor’s degree in botany. By the time she left Yangon, Ferozah was the sole member of her family left in Myanmar. Everyone else, starting a decade ago with her father, had already left for Malaysia. She did not experience the same raw, life-threatening violence as the Rohingya in Rakhine state, but she recalls the little digs in class and in the school grounds from other students, reminding her that Muslims are not widely liked in Myanmar. “The teachers said nothing even if the Buddhist students mocked me,” Ferozah said. Anti-Muslim and anti-Rohingya sentiment has ramped up in the years since Ferozah left, and with elections due to take place in Myanmar in November, it is unlikely that the country will adopt any major policy change that might persuade those Rohingya contemplating leaving for Malaysia to stay. The arrival of the boat people has prompted harsh words not only in Putrajaya, Malaysia’s federal administrative capital, but also from former Malaysian leader Mahathir Mohamed, the country’s longest-ruling prime minister. Addressing the June 12 conference, he said that unless Myanmar softens its stance on the Rohingya, it should be expelled from the Association of Southeast Asian Nations, the 10-country regional bloc that Myanmar joined in 1997, partly at Mahathir’s suggestion. “There is a process of genocide [against the Rohingya] going on in Myanmar,” the nearly 90-year-old Mahathir thundered, to enthusiastic applause from the 200 or so delegates at the conference. Mahathir previously sought Myanmar’s expulsion from the bloc in 2003 after an army-backed mob tried to assassinate opposition leader Aung San Suu Kyi, who was kept under house arrest for 15 years by the junta that controlled the country up to 2011. According to Mahathir, Suu Kyi, a Nobel Peace Prize recipient, did not reply. “We sympathized with her when she was detained, and we thought she was very concerned about freedom and her people not being oppressed,” Mahathir said, when asked by the Nikkei Asian Review about the apparent snub. Anwar laughed dismissively when asked about Mahathir’s recent denunciation of Myanmar, noting his previous silence on the issue and recalling that, “Tun (a Malaysian honorific) was prime minister for many years when many Rohingya [were forced to leave] for Malaysia.